Facebook makes a “lite” version of its app for Android phones that uses less data and battery life and is a smaller download. 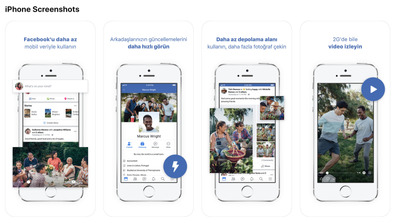 A version for iPhones appears to have quietly launched in Turkey. Facebook Lite for iOS isn’t available in the United States yet. Facebook’s main app for iPhones is a big download, packing a lot of features and code into a download that can top 500MB, according to Apple’s App Store. But the company also makes a slimmed down version of its app, called Facebook Lite. It was originally intended for people in developing countries where mobile data can be unreliable. But lots of people in countries where LTE data is plentiful like the slimmed down app, too, because it uses less data than the main Facebook app. Facebook Lite previously was available for Android phones in certain countries, including the United States. But now, it appears that Facebook has launched Facebook Lite for iOS. We were first tipped off by Sensor Tower, an app analytics firm. The download is less than 5MB. Its main features are that it uses less battery, bandwidth, and device storage. There’s only one catch: the app is only available in Turkey at the moment, and it’s a test for now, according to someone familiar with the rollout. Facebook often launches new products in only a few countries first, in order to collect data ahead of a wider launch. On its help page, Facebook says the iOS app is available in “select” regions. Facebook launched Facebook Lite for Android in 2015, and it had over 100 million users in 2016. It launched for Android in the United States earlier this year. Facebook’s not the only app that’s gotten a “lite” version recently. Twitter, Messenger, YouTube, and Skype all offer “lite” versions for Android phones.